This is a hilariously funny story for the adult reader…but also for the young child. That is a hard balance to achieve. Wonderful message about friendship and learning to ‘stand on one’s own two feet’ and discovering the endless possibilities of what life has to offer for each one of us. Opportunity for discussion about learning to do things on our own AND trying to do new and different things. There are lots of reading readiness games you can play with chopsticks…write letters or sight words on small pieces of paper and fold the papers and put them in a bowl…each player takes turns picking out a paper and reading what it says. This activity also develops fine motor coordination. Chop sticks can be purchased at many grocery stores – if you cannot find them, ask at a local Chinese restaurant. They may have some for sale or even give you a set for free. 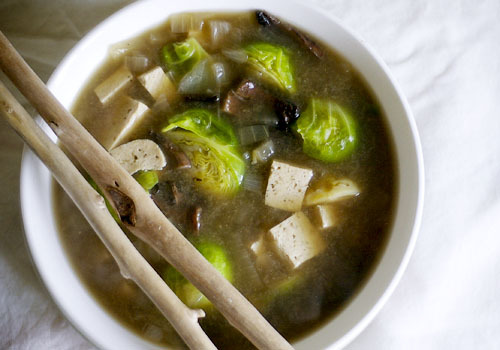 Then make this yummy miso soup (the recipe is one of 100 child-friendly recipes from Show Me How) so you and your child can experiment with using chopsticks. They are lots of fun, but call for a lot of patience. You will need: 4 cups water, 1 cup corn kernels, ½ cup chopped green onion tops (scallions are great), ¼ cup dark miso, 1 Tb honey, 1 Tb sesame oil (subsitute canola oil if necessary), 1 sheet of nori seaweed torn into small pieces (substitute spinach or kale leaf), ¼ lb diced tofu and a large pot. Bring water to a boil, add corn and lower heat to simmer. Add other ingredients and heat. Makes 5 servings. You can use the chopsticks to eat the tofu and corn…what a challenge!!! Did you get a chance to read the SEVENTY-NINE Halloween stories that were entered in Susanna Hill’s Halloweensie Contest? The votes are in and the winners have been announced!! One more item: I’ve just signed up to participate in the Kid Lit Blog Hop Holiday Giveaway Extravaganza…please stay tuned for more info and a list of blogs you can visit to win prizes…the blog hop will take place Dec 6-13…check the button below. 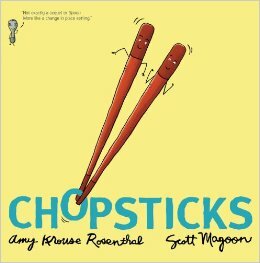 This entry was posted in Book Review, Cooking with Kids, Perfect Picture Book Friday and tagged Amy Krouse Rosenthal, Chopsticks, Miso soup recipe, Picture book, Reading Readiness, Susanna Leonard Hill, Word games by viviankirkfield. Bookmark the permalink. This book sounds really funny! Chopsticks joined at the hip and meeting a fork in the road!! I have been amused at times observing peoples use of chopsticks. Slurping works fine for me. i think I’ll be looking for this book. Thanks! I love this book. I agree it’s a good read for both the child and the parent! Love the activity to use chopsticks! We took Jeremy to a Chinese restaurant a couple of months ago…they gave him child-friendly chopped sticks (joined at the top) and he LOVED eating with them. When I read the book to him last night and told him about the different activities we could do with the chopsticks, he wanted to play them right away. :) Glad you liked the book and activities, Stacy…I think Enzo would have fun…you could have folded papers of different colors and call out different colors and have him try to pick them up. 🙂 Or numbers, or letters or whatever you were working on teaching him at the moment. We loved the creativity in this book.. so many lessons and such wonderfully executed! Vivian you write such amazing reviews.. would love for you to share this on our bi-weekly Blog Hop. This book IS a great read, and I personally love eating with chopsticks because they slow me down! I love her books. Great choice for sparking creativity again, Vivian! Thanks so much, Miranda! I had so much fun in the children’s section of the library last night…the library itself is a lovely stone building, plunk in the center of Amherst Village…we just moved here and so I went in to meet the librarian (and give her a copy of my book for their parent/teacher resource shelf). My husband finally came to look for me and help me carry the huge stack of treasures I had found. :) Chopsticks was one of those. I loved it immediately! I love your idea to think up new ideas for household items! Thanks for sharing this book, Vivian. This sounds wonderful for independence and I love that chopsticks game idea. Thanks, Vivian! They come to a “fork in the road”? What a riot! Looks like a fun book, Vivian. Yup…it is a fun book, Jarm. What I loved so much about it was that, although many of the jokes are over the heads of little ones (aimed at the adult reading the story), it is a very child-friendly story…with so many of those play-on-words scenarios…so very clever. My grandson loved it! I love Amy Krouse Rosenthal’s out-of-the box stories. She turns the unusual into beautiful stories for kids. I haven’t read it yet, but I definitely will. Yes, I love the line “fork in the road.” Lots of fun! It’s a truly fun story…glad you will try to get a copy, Pat! That recipe sounds yummy! Thanks so much for sharing with the Kid Lit Blog Hop. When I moved my parents and cleaned out their house, we found a cloth in the back of the china hutch, and inside, wrapped in a cloth were 9 sets (and one spare) of ivory chopsticks! The grandchildren love using them, and the best way to get them to eat steamed broccoli is bring out the chopsticks! When my tots were tiny, kitchen utensils were the very best toys! The whisk was a favorite! Oh dear. :) I guess that’s how you stay in such great shape. :) Seriously though, I hope you had a fantastic time at the Lititz Kid Lit Festival…when I lived in NYC, we went to Penn Dutch country lots of times…Lancaster, Lititz, etc. That was over 40 years ago…they were small towns then…country roads and not much traffic. I’m sure things have changed a great deal since then. Maybe, Erik! One never knows. :) That would be so cool! What a great premise! I need to check this book out. Thanks, Vivian! My kids love our chopstick suppers. Amy’s books are always so inventive. ‘Hope the library has a copy. Thanks for the review. lol, I ditto what Joanna said, I love eating with chopsticks for the same reason, also like Pat I enjoy Amy’s unique spin on the simplest of things. Great review, oh and I can smell that soup from here! This is one of my favorite books. So clever! Well, all of her books are just amazing! I’ve read Little Hoot, Little Pea, and Little Oink too many times to count! That soup looks yummy! I think it could become one of my favorite soups! My kids (and I) always love books with a bit of humor. Looking forward to reading it. Thanks for sharing on the Kid Lit Blog Hop.